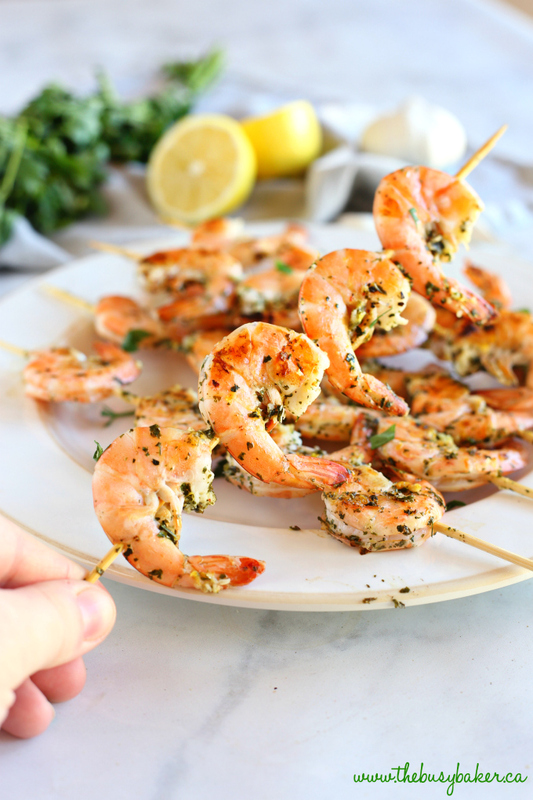 These Lemon Garlic Grilled Shrimp Skewers make the perfect addition to any healthy meal! Marinated in fresh garlic, lemon, and white wine, these grilled shrimp are perfect for summer barbecues or grilled indoors any time of year! Watch the VIDEO below to see how I make them and don’t forget to scroll down to the end of this post for the FULL PRINTABLE RECIPE! *I originally posted this recipe in June 2015. I’m re-sharing it today with updated photos and a video tutorial to make it even easier for you to make them at home in your own kitchen! Since the new year began I am definitely on a health kick. I’ve been enjoying delicious smoothies, salads, and lots of lean proteins. These Lemon Garlic Grilled Shrimp Skewers are one of my absolute favourite lean protein sources because they’re so low in fat and incredibly delicious!! Luckily, my family loves them and so we’ve been enjoying them over salads or in wraps for lunch, and beside our favourite roasted potatoes and grilled veggies for dinner. I grew up eating seafood often, which is funny because I grew up in the geographical centre of Canada, pretty much the furthest point in Canada away from any ocean. 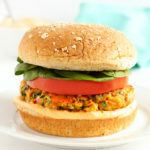 My husband is from the west coast and grew up on freshly caught salmon and crab, so we like to integrate sustainable or ocean-friendly seafood into our diets as much as possible simply because it’s a healthy source of lean protein (check out the Marine Stewardship Council and Ocean Wise for more information on sustainable seafood). These shrimp skewers are so quick to prepare and they are so juicy and flavourful. You’ll definitely want to add these to your menu if you’re a shrimp lover like me! In the winter time, we grill these Lemon Garlic Grilled Shrimp Skewers indoors but in the summer time we cook them up on the outdoor grill! They’re delicious either way and I just know you’ll love them as much as we do! Serve these shrimp skewers alongside a baked potato and some steamed vegetables, or over a homemade Caesar salad using my healthy Greek Yogurt Caesar Salad Dressing recipe and you’ve got yourself a healthy, flavourful meal! 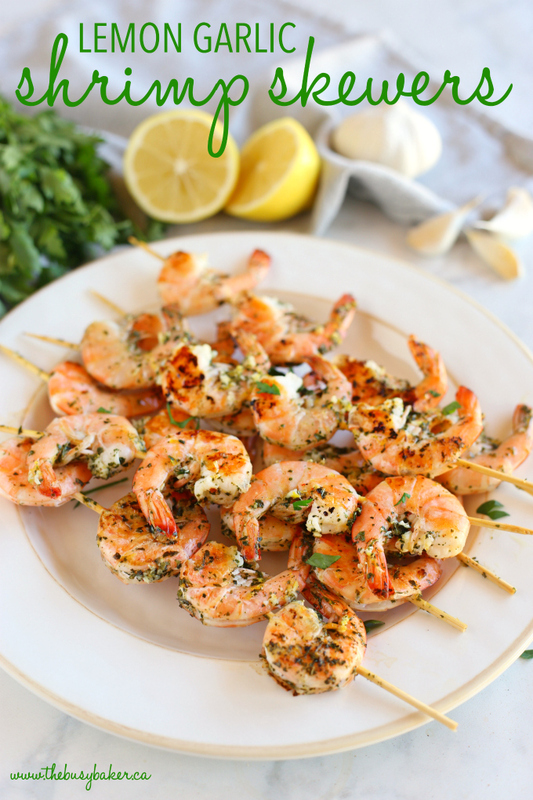 I hope you love these Lemon Garlic Grilled Shrimp Skewers as much as we do! Let me know in the comments below, what’s your favourite way to enjoy shrimp? 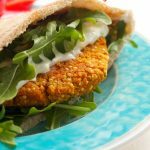 Looking for more healthy recipes? 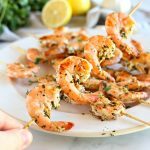 Before you grab the recipe for these Lemon Garlic Grilled Shrimp Skewers below, check out these delicious recipes!! 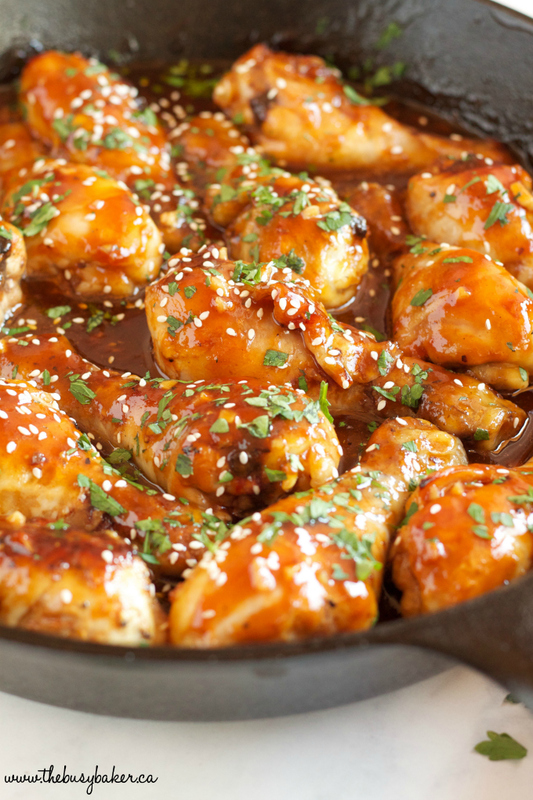 This Best Ever Honey Garlic Chicken recipe is the BEST honey garlic chicken you’ll ever have!! 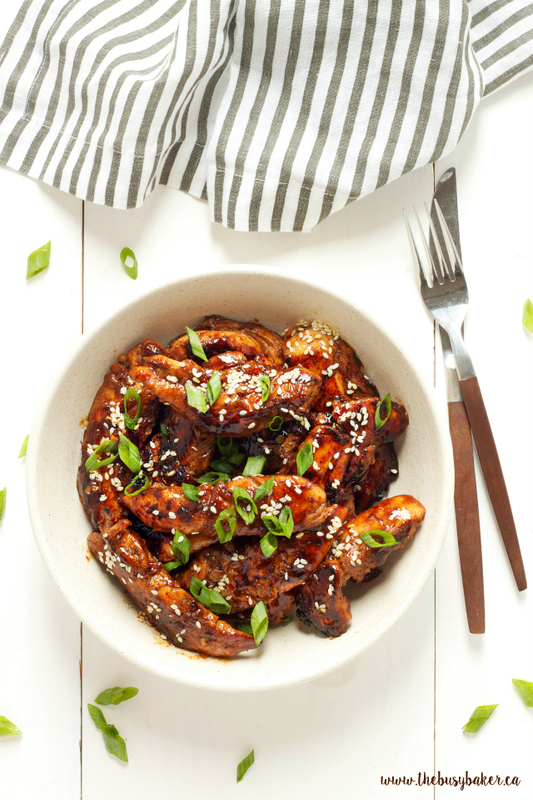 This Easy Sticky Asian Chicken is a super easy weeknight stir-fry recipe! 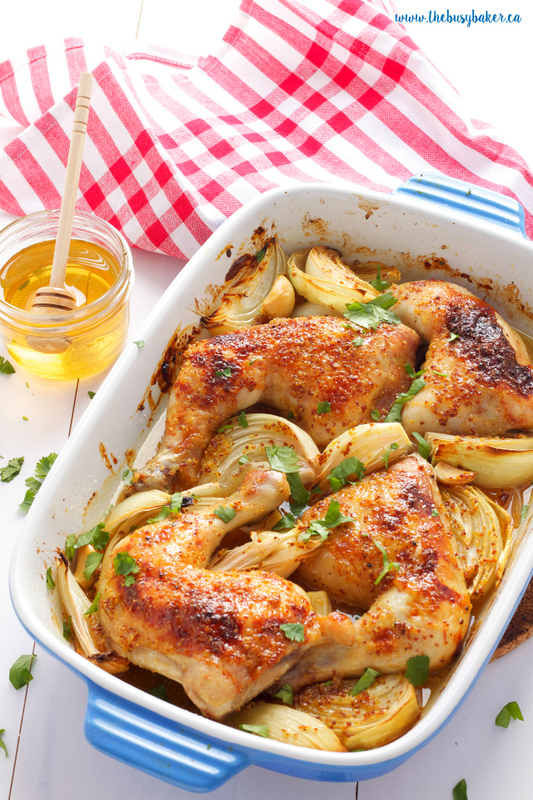 This Honey Mustard Roasted Chicken is SO easy to make and deliciously sweet! 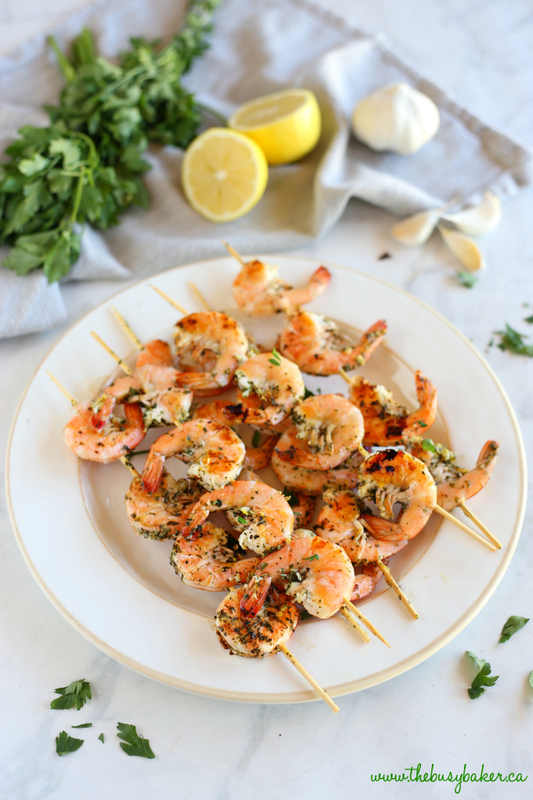 These Lemon Garlic Grilled Shrimp Skewers make the perfect addition to any healthy meal! Marinated in fresh garlic, lemon, and white wine, these grilled shrimp are perfect for summer barbecues or grilled indoors any time of year! Pour the water into a shallow baking dish and add the skewers to it. Let them soak in the water as you're preparing the shrimp and the marinade. Add the lemon zest, lemon juice, olive oil, garlic, white wine, parsley, and salt and pepper to a bowl and whisk the ingredients together. Rinse the shrimp and remove the shells (if you wish), leaving the tails on. Remove the wooden skewers from the water and discard the water. Add 4 shrimp to each skewer, making sure the skewer pierces each shrimp in two places (this will prevent them from falling off the skewers as they're grilling). Lay them in a shallow baking dish. 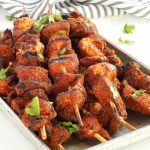 Give the marinade one last whisk to combine all the ingredients and pour it over the shrimp skewers, making sure each one is nicely coated. Cover the baking dish with plastic wrap or a lid and put it in the refrigerator for 20-30 minutes. This will allow the shrimp to really soak up all the flavours in the marinade (especially the garlic!). 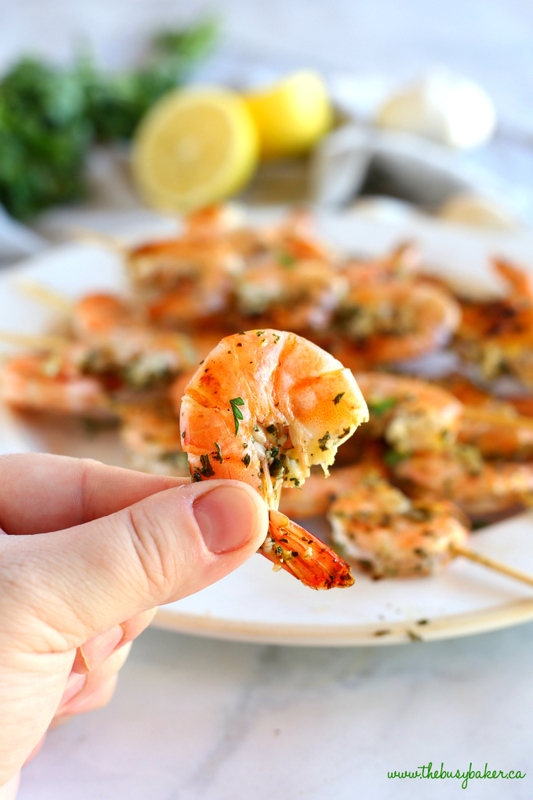 Once 20-30 minutes have passed, remove the shrimp from the fridge and heat up your indoor or outdoor grill. Place the shrimp skewers on the grill and discard the leftover marinade. Grill the shrimp skewers on low heat for about 3-4 minutes per side, or until the flesh of the shrimp turns pink and becomes opaque. Once they're done (and be careful not to overcook! ), remove them to a platter. Garnish with some chopped fresh parsley (if you wish), and serve! Gorgeous Shrimp Skewers! Now I want this for dinner. Love the lemon garlic combo. These look so delicious! Thank you! The lemon and garlic combo is just the best! These look fantastic. 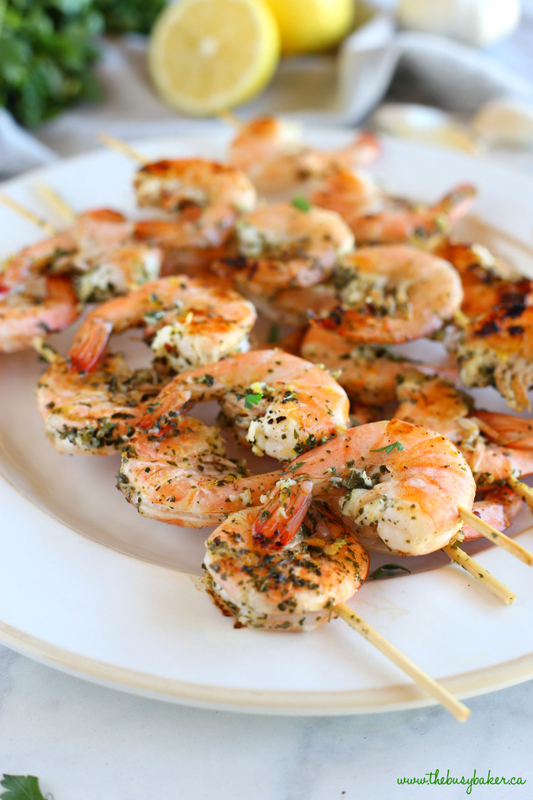 I love an easy shrimp recipe for the grill. Kabobs are one of my favorite ways to grill. Thanks Alison! Easy shrimp recipes are the best! Thanks Karen!! This recipe is definitely inspired by the simple flavours of Shrimp Scampi! I make something similar to this but we serve it on ciabatta. The bread mops up the gorgeous juice- you have to try it! Great shrimp recipe! Looks perfect for summer grill time! Beautiful Shrimp Skewers!! I love seafood so I need to try this recipe soon. Pinning. That looks so yum Chrissie! Perfect for summer! 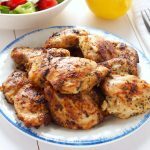 What a delicious, light, and easy to put together recipe! My entire family loves shrimp and you've reminded me that it's been a while since I cooked some for them. I think they would love this recipe! I tried this recipe last night and it was delicious. 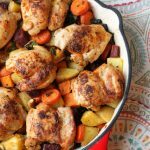 I will be adding this recipe to my favorites for sure! I love easy and flavorful meals like this! The ingredients complement yet make the shrimp shine! So perfect for an appetizer or dinner. Pinned! Thanks Carol! I hope you give this one a try! These look so good! I definitely have to make them soon… or tonight! My husband would adore me if I made these. They look seriously so so so good. Shrimp are my family’s favorite! YUM! Very nice flavor. We just loved the sauce! My kids are already asking when we will make this again. I served it with rice which was just ok. I need to find something more interesting to serve with this meal. We did enjoy a nice salad with it, which kept the meal light. I would make 2 skewers per person next time. I usually serve these with garlic mashed potatoes on the side and a salad. Glad you enjoyed! !